1.1 What is Autogenic and Reciprocal Inhibition? Muscle Energy Technique (MET) is a form af a manual therapy which uses a muscle’s own energy in the form of gentle isometric contractions to relax the muscles via autogenic or reciprocal inhibition, and lengthen the muscle. As compared to static stretching which is a passive technique in which therapist does all the work, MET is an active technique in which patient is also an active participant. MET is based on the concepts of Autogenic Inhibition and Reciprocal Inhibition. If a sub-maximal contraction of the muscle is followed by stretching of the same muscle it is known as Autogenic Inhibition MET, and if a submaximal contraction of a muscle is followed by stretching of the opposite muscle than this is known as Reciprocal Inhibition MET . Autogenic and reciprocal inhibition both occur when certain muscles are inhibited from contracting due to the activation of the Golgi tendon organ (GTO) and the muscle spindles. These two musculotendinous proprioceptors located in and around the joints and muscles respond to changes in muscle tension and length, which helps manage muscular control and coordination. The GTO, located between the muscle belly and its tendon, senses increased tension when the muscle contracts or stretches. 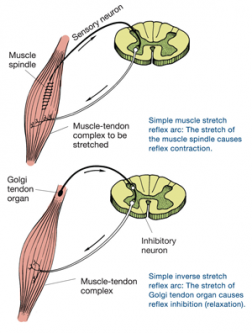 When the muscle contracts, the GTO is activated and responds by inhibiting this contraction (reflex inhibition) and contracting the opposing (antagonist) muscle group. This process is known as autogenic inhibition. The GTO response plays an important role in flexibility. When the GTO inhibits the (agonist) muscle’s contraction and allows the antagonist muscle to contract more readily, the muscle can be stretched further and easier. Autogenic inhibition is often seen during static stretching, such as during a low-force, long-duration stretch. After 7 to 10 seconds, muscle tension increases and activates the GTO response, causing the muscle spindle in the stretched muscle to be inhibited temporarily, which makes it possible to stretch the muscle further. The muscle spindle is located within the muscle belly and stretches along with the muscle itself. When this occurs, the muscle spindle is activated and causes a reflexive contraction in the agonist muscle (known as the stretch reflex) and relaxation in the antagonist muscle. This process is known as reciprocal inhibition. Post Isometric Relaxation is a technique developed by Karel Lewitt .Post Isometric Relaxation (PIR) is the effect of the decrease in muscle tone in a single or group of muscles, after a brief period of submaximalisometric contraction of the same muscle. PIR works on the concept of autogenic inhibition. The hypertonic muscle is taken to a length just short of pain, or to the point where resistance to movement is first noted. A submaximal (10-20%) contraction of the hypertonic muscle is performed away from the barrier for between 5 and 10 seconds and the therapist applies resistance in the opposite direction . The patient should inhale during this effort. After the isometric contraction the patient is asked to relax and exhale while doing so.Following this a gentle stretch is applied to take up the slack till the new barrier. Post Facilitation Stretch (PFS) is a technique developed by Janda . This technique is more aggressive than PIR but is also based on the concept of autogenic inhibition. The hypertonic and shortened muscle is placed between a fully stretched and a fully relaxed state. The patient is asked to contract the agonist using a maximum degree of effort for 5–10 seconds while the therapist resists thepatients force. The patient is then asked to relax and release the effort, whereas the therapist applies a rapid stretch to a new barrier and is held for 10 seconds. The patient relaxes for approximately 20 seconds and the procedure is repeated between three to five times and five times more. Instead of starting from a new barrier, the muscle is placed between a fully stretched and a fully relaxed state before every repetition. Reciprocal Inhibition MET is different from the above two techniques that it involves the contraction of one muscle followed by stretching of the opposite muscle, because contrary to PIR and PFS, Reciprocal Inhibition MET as the name implies is based on the concept of Reciprocal Inhibition. The patient pushes towards the restriction/barrier whereas the therapist completely resists this effort (isometric) or allows a movement towards it (isotonic). This is followed by relaxation of the patient along with exhalation, and the therapist applies a passive stretch to the new barrier. The procedure is repeated between three to five times and five times more. Muscle Energy Techniques can be used for any condition in which the goal is to cause relaxation and lengthening of the muscles and improve range of motion (ROM) in joints. Muscle energy techniques can be applied safely to almost any joint in the body. Many athletes use MET as a preventative measure to guard against future injury of muscles and joints. It is mainly used by individuals who have a limited ROM due to facet joint dysfunction in the neck and back, and for broader areas such as shoulder pain, scoliosis, sciatica, asymmetrical legs, hips or arms, or to treat chronic muscle pain, stiffness or injury . Franke H et al in a systematic review examined the effectiveness of MET in the treatment of patients with non-speciﬁc low back pain (LBP) in comparisson with control interventions. It was found a poor quality of randomized control trial (RCT) studies of MET treatment in patient population with a non specific LBP. This indicates that more better quality studies are needed to confirm the effectiveness of MET for non-specific LBP . In a randomized control trial performed by Szulc et al the efficacy of combined method of Mckenzie and MET was analyzed for patients with LBP. The study showed positive results of a combination of Mckenzie and MET therapies in terms of significantly decreased outcomes in Oswestry Disability Index , significant alleviation of pain in Visual Analogue Scale (VAS) , and significantly reduced size of spinal disc herniation. The combined method can be effectively used in the treatment of chronic LBP . Phadke et al in a RCT investigated the effect of MET and static stretching on pain and functional disability on patients with mechanical neck pain. It was found that MET was better than static stretching technique in terms of outcomes in VAS and Neck Disability Index (NDI). An immediate effect of MET on Posterior Shoulder Tightness was found in basketball players in a RCT performed by Moore et al. There were improvements of glenohumeral joint range of motion in horizontal adduction and internal rotation . ↑ 1.0 1.1 1.2 1.3 1.4 Chaitow L, Crenshaw K. Muscle energy techniques. Elsevier Health Sciences; 2006. ↑ 2.0 2.1 2.2 Lewit K, Simons DG. Myofascial pain: relief by post-isometric relaxation. Archives of Physical medicine and rehabilitation. 1984 Aug;65(8):452-6. ↑ 3.0 3.1 3.2 Janda, V. 1988. Muscles and Cervicogenic Pain Syndromes. In Physical Therapy of the Cervical and Thoracic Spine, ed. R. Grand. New York: Churchill Livingstone. ↑ https://leggehealth.ca/portfolio-item/muscle-energy-technique-met/ (accessed 23 March 2018). ↑ Franke H, Fryer G, Ostelo RWJG, Kamper SJ. Muscle energy technique for non-specific low-back pain. Cochrane Database of Systematic Reviews 2015;(2):CD009852. ↑ Szulc P, Wendt M, Waszak M, Tomczak M, Cieślik K, Trzaska T. Impact of McKenzie Method Therapy Enriched by Muscular Energy Techniques on Subjective and Objective Parameters Related to Spine Function in Patients with Chronic Low Back Pain.Med Sci Monit 2015; 29;21:2918-32. ↑ Apoorva Phadke, Nilima Bedekar, Ashok Shyam, Parag Sancheti. Effect of muscle energy technique and static stretching on pain and functional disability in patients with mechanical neck pain: A randomized controlled trial. Hong Kong Physiotherapy Journal 2016; 35:5-11. ↑ Moore SD, Laudner KG, McLoda TA, Shaffer MA.The Immediate Effects of Muscle Energy Technique on Posterior Shoulder Tightness: A Randomized Controlled Trial. J Orthop Sports Phys Ther 2011;41(6):400-7.